Oh My Goodness ~ The Bully! 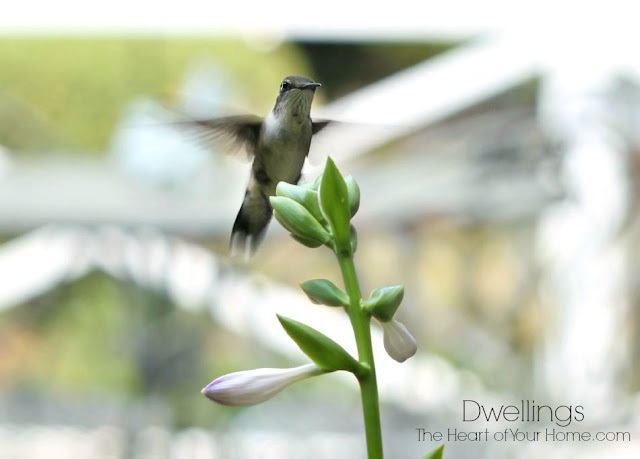 There are many flowers that hummingbirds are attracted to planted in our garden and in urns on the deck. We also have two hummingbird feeders; one just outside each window in the keeping room. relaxing and watching the hummingbirds fly in for a drink. They would dart in, take a quick drink and then quickly dart away. I began to wonder why so quick, wishing they would perch a little longer to enjoy the fresh sugar water I had just placed out for them. Then I noticed some weren't drinking at all, they were being chased away as soon as they approached the feeders. Oh my goodness, as I continued to watch I discovered that we have a bully! you already know how much I love my feathered friends. But...I'm not too fond of bullies. 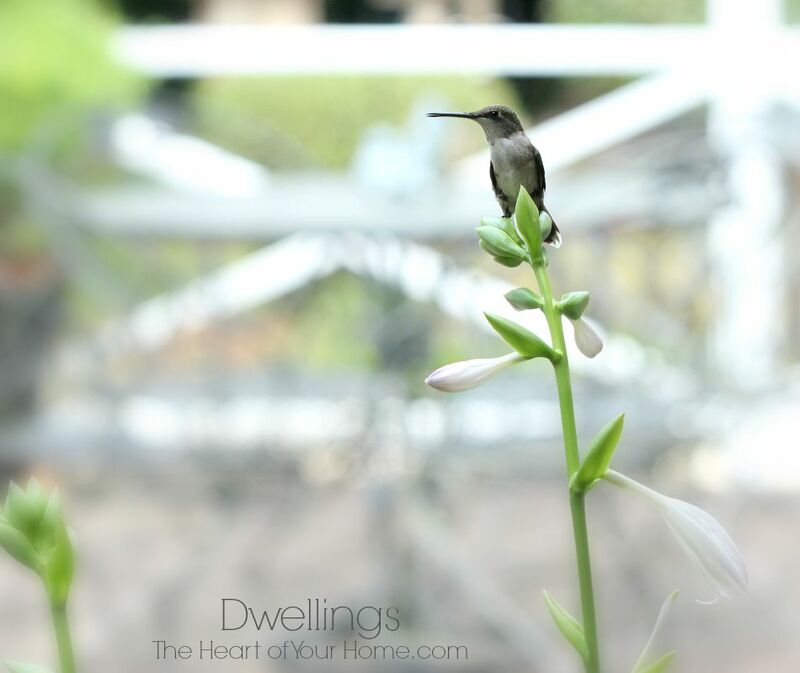 ...and when he's finished he perches on the host blooms just across from the feeder to stand guard; chasing away the other hummingbirds that come to get a drink. 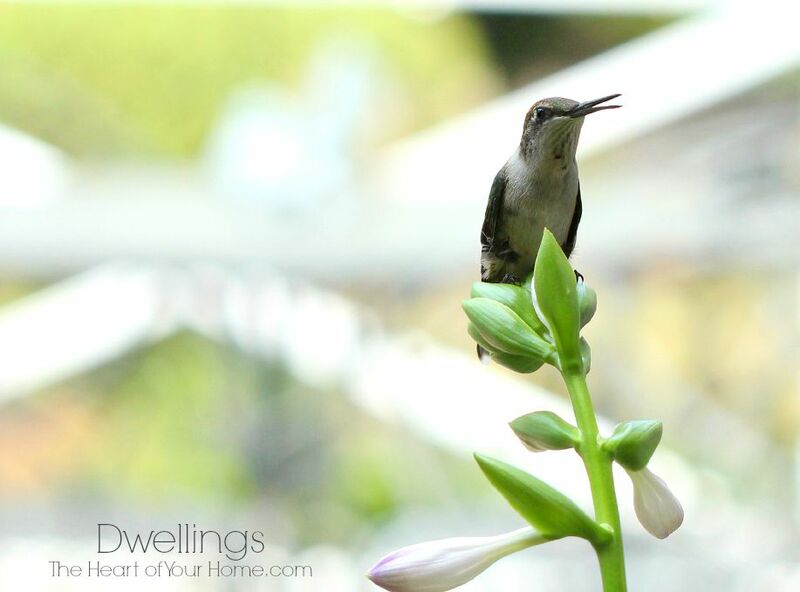 Did you know that male hummingbirds are very aggressive? They will hit chests while in flight and do a lot of talking to each other to claim their territory. They are such fun to watch; those tiny wings flapping like crazy! Here's the bully. Full of drink and perching on the nearby hosta to stand guard; chasing off the other hummingbirds that come by for a drink. Feeling bad that this bully was keeping other hummingbirds from both of my feeders, I decided to move one of the feeders to the front kitchen window. I figured this little hummer can't stand guard in the front and back, so I moved one. Since then, I've done a little reading up on bully hummingbirds and discovered that's not the best way to handle them. They say more feeders, more hummingbirds and more peace. Alright then...I'm off to my local bird store to stock up! 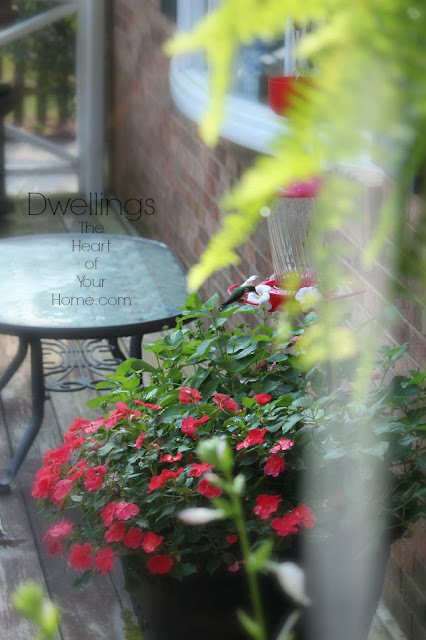 How about you...do you feed the hummingbirds? Have bullies? Hop over to check out this week's features and inspiration at AMAZE ME MONDAY! Cindy, some years we have many hummingbirds and others not so many! They LOVE our deck boxes! They love impatiens and I'm hoping they enjoy the vincas this summer, too! I always have bullies at my hummingbird feeder. Last year I had a bully that I actually saw put his beak on the back of another hummer and pull at the feathers. I couldn't believe it, but then it happened again. Those hummers are so much fun to watch! We haven't had feeders for many years, but I may put some out when our weather cools down. They really love Arizona in the winter! Yes, yes, and yes! Love hummers, have multiple feeders, and they still bully! Sometimes I feel right in the crossfire, as they zigzag across my landscape. The real bully is an unsuspected one that I posted about two years ago - the praying mantis! Did you know they can devour a hummer simply by lurking on the feeder? It's true. We have very few hummers here but ai love to watch them. I had no idea there were bullies among them! I hope your new technique works! Love my hummers but with all the rain my hummingbirds came early on then just stopped coming. I have been feeding them religiously for almost 4 years, this year nothing - the water gets bad and is always still full. I am so sad, but with the constant rain and a broken foot I haven't been around much to watch or care I guess. Neat post and amazing pictures! And yes, there's always a bully! Next year, more feeders and hoping for the best. 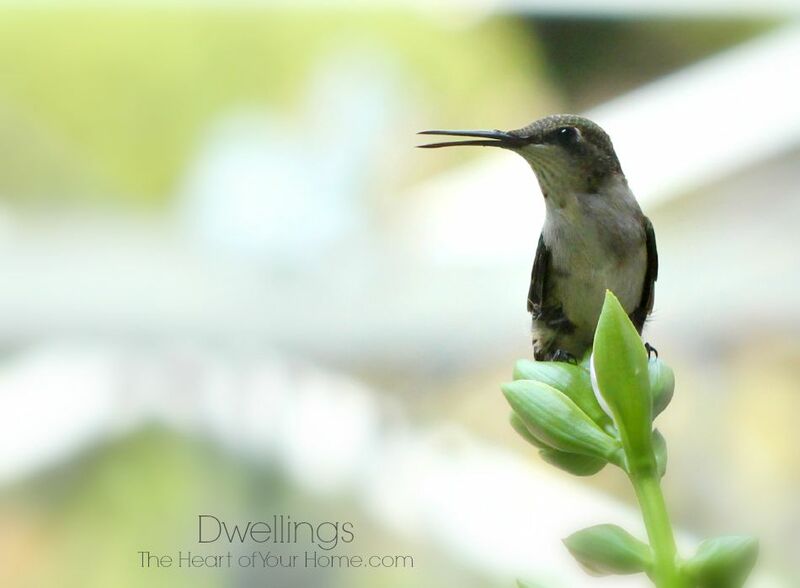 I looove hummingbirds- I wish that we were able to keep them as pets! Gorgeous pics! I don't have any hummingbird feeders, but we got a couple for my daughter and she had tons of them show up, even with us sitting right there. Yes they are always so territorial. By the way, my mom gets more hummingbirds than anyone I've ever seen. She buys these little feeders at Wild Birds Unlimited and has the best luck! I love humming birds and wish we had them around here but we don't have the right plants I guess. I love the photos and the story. I grow so many flowers for them all around my house that they rarely go to the feeder anyway. right now their favorite is zinnia. They will circle the flower, sipping from each little tiny yellow bloom around the center. They also love my coleus in bloom. Oh Cindy, I love that video of the bully hummingbird!! To be so small and adorable, they sure are feisty! We took our hummingbird feeder down this year, because we just don't seem to get many hummingbirds, and we're not sure why. We replaced it with a thistle sock for the goldfinches, which has been a big hit. We have four feeders up outside our screened porch, each with something different in it. We do see at least one dispute a week between the different birds. My in-laws feed the hummingbirds, and they've mentioned that certain ones will stalk the feeder and run the others off. What rascals! Your pictures are always so good, and I enjoyed this post. Thanks for sharing, Cindy, and have a great week! Excellent photography and videos!! We love hummers, too. And yes, we have a resident bully ~ he has even dive-bombed us! We have a bully too. So typical of hummingbirds. There is a crepe myrtle bush right next to our feeder outside my office window and there the bully sits and chases everyone else away. They are hilarious to watch and I look forward to this each year when the hummingbirds return to our area.